NEW YORK — Former Syracuse stars James Southerland and Brandon Triche were not selected in Thursday night’s NBA draft. Southerland, who was in attendance at the Barclay’s Center, had been projected as a mid to late second round pick in some mock drafts. Triche was not projected in the major mocks. Southerland played 29.5 minutes in his senior season, and averaged 13.3 points and 5.2 rebounds. He tied a single-game school record with nine 3-pointers for 35 points against Arkansas and also set a Big East tournament record with 17 3-pointers, including a perfect 6-for-6 start against Pittsburgh. 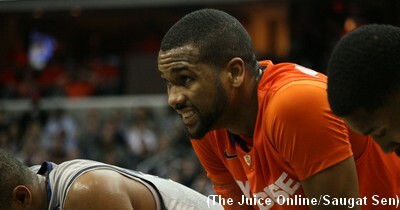 In Syracuse’s final Big East Tournament, Southerland was named to the Big East All-Tournament Team. 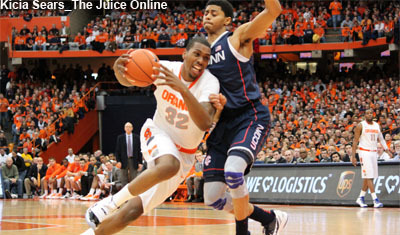 Triche, a four year starter at Syracuse, averaged 13.9 ppg his senior year. He was named a Third Team All-Big East selection in the 2012-13 season. Earlier in the night, former Syracuse guard Michael Carter-Williams was taken with the 11th pick in the draft by the Philadelphia 76ers.